Switches should be grounded to protect you if you have wet hands or a plumbing leak. 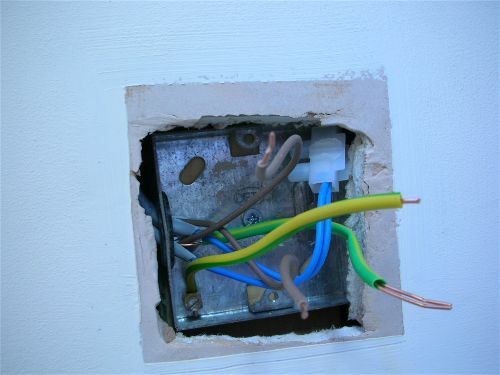 There has to be a ground wire in the wall plate box somewhere as the box itself is grounded. The should be a screw terminal inside the box. You switch ground goes to it. As Brad says, capping off a ground wire on any item is against building code. You can see the Ground connection on the bottom right in the image that I have linked to. The Lutron D600P is a preset single pole dimmer. Wiring is pretty straight forward as show in this diagram. Recheck wiring and if OK, continue below. If power is present on both wires (black / red wires), power is being passed through the switch to the lamp and the light should be on. If not, try replacing the lamp. Minimum recommended connected load is 40 watts. This switch is ONLY for use with filament type lamps - such as traditional tungsten, halogen, etc. It is NOT to control speed of Fan Motors, nor dimming of CFL (compact fluorescent lamps) energy saving types or other ballast operated lamps such as High (or Low) Pressure Sodium, Metal Halide, Fluorescent, etc. as this would create a high heat condition and could cause a fire. I hope this helps & good luck! nut over this wire for a single-pole application. 2) Green wire connects to bare ground wire. Or bare ground to bare ground. Add a comment for more free help. Also take advantage of fixya phone service. For a price, fixya expert speaks with you over phone while you work on dimmer or any do-it-yourself project. We are always less expensive than a service call. Lutron shows widest selection of dimmers. The wattages you posted are standard for multiple dimmers. Once you identify type of dimmer, add a comment and say if dimmer is single-pole or 3-way. A 3-way dimmer would be in a hallway, where more than 1 device controls same lights. Single pole is where one device controls lights. If I know what dimmer you have, I can search for the product and add another comment. For example, let's say you have 3-way Skylark dimmer. Or 3-way rotary dimmer, etc. If information above doesn't help, then take advantage of fixya phone service. Fixya expert can talk with you over the phone for a price. Switches are single-pole or 3-way. Single pole switches have 2 screws plus green ground screw. 3-way have 3 screws plus green ground screw. Identify your switch and your dimmer and add a comment. I will look up the information. I have a DL-3PSLHW-WH switch with no wiring diagram. It is single pole or 3-way. Need diagram. You posted under Lutron 3-way dimmer. You didn't say the number of screw terminals on device or color of those screws. If your device has two brass screws, then it is single pole. If you are replacing 3-way switch, identify wire on dark screw >> connect this wire to dark screw on dimmer. Other two wires connect to either brass screw. If device has wires instead of screws, the color of those wires is an important clue. Answer back with the colors of those wire and it is easier to help. Different dimmers are suitable for different types of lighting. In an effort to help you, I searched my files for Lutron dimmers. The NT-3PS is a 3-way dimmer. If the help above does not get you going, answer back with more information and we can help. What you do is to put a pigtail on each switch and use a wire nut/Scothlock to join to all the ground wires in the box. You will need to return the 3-way dimmer and get a single pole dimmer, as the Lutron Skylark series is suspectible to failure if connected to a live circuit first, or misconnected at intial installation. As an electrician, I ceased using these dimmers years ago, due to the rash of call-backs by customers and went with Leviton togglers and have had excellent results. If you purchased it at a 'big box' store, they will accept the return as a defective item, as they have national agreements with their suppliers to accept customer returns. Just tell them it didn't work and you want a store credit, you can then purchase the lower priced single pole dimmer you need and save some money in the process too. Hope you find this Very Helpful - best regards! The old switch is just a single pole switch. The new one is for fan speed control. You need to use a regular single pole switch like you had. Or you can use a single pole switch on the Lutron you bought if you can figure out which wires to use. Do you have a meter? Luton lights switches don't work in most of the house. We have a Lutron lighting system which was installed in 2008, I am not sure which system it is. Last night when we went to turn on the lights, they would not go on (except for the bedroom/bath control), unless we went into the switch in the garage and pressed "Home" in which case certain lights went on. When we press any of the switches the house (again, except for the bedroom/bath), they just blink and the lights will not goon. Installing Lutron Maestro multi-location switches. Where does neutral wire attaches to at the end of circuit? The Maestro and light wire and power are in one box. the next location controlled by a Maestro Companion works fine, but there's a 3rd Companion at end of circuit. I'm not sure where the final wires go. I use the recommended setting, black wire is a traveler so it goes to brass screw, Red wire to Blue screw, green is Ground. But what about White Neutral wire? Where does it go? I tried to just end it loose with a wire nut, but won't work. Suggestions? I have a Lutron remote dimmer and it has stopped working, I've had it for about 3 years with no problems until now. Do they stop working after a few years? Dimmer switch lights but does not dim? Have a manual for Lutron Electrical Supplies?